Special DSNU Architectural Consultant Co., Ltd.
Special thinkTREE Architects & Partners, Inc.
′New Office Design′ introduces 59 offices classified by their sizes in three sections : 0~700㎡, 700~2,500㎡ and oversized than 2,500㎡. 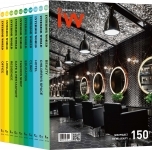 ′Small Restaurant Design′ covers about 70 restaurant projects, classified by their sizes : 0~150㎡, 150~250㎡ and oversized than 250㎡. Each year will have a single-volume collection of award winning works from the year′s design competitions. ′Small Cafe&Shop′ covers hundreds of cafe & shop with modern, classical and funky style on sized below 100m².